Here at Low VA Rates we often get the question what are the VA loan rates today? Interest rates change daily and with any loan anywhere, interest rates stress people out the most. No one really wants to pay a lot of money to get a smaller amount of money, and when you break a loan down into its simplest terms, that’s really what you’re doing. Just the thought of it makes people grumpy. But unfortunately there isn’t any way around it. When buying a house, I almost guarantee a home loan will be involved and I definitely guarantee that that loan will have interest. The silver lining is that VA loan rates are usually much lower than your conventional mortgage rates, this ultimately can save you thousands of dollars in the long run. This is one of the many benefits of the VA house loan. 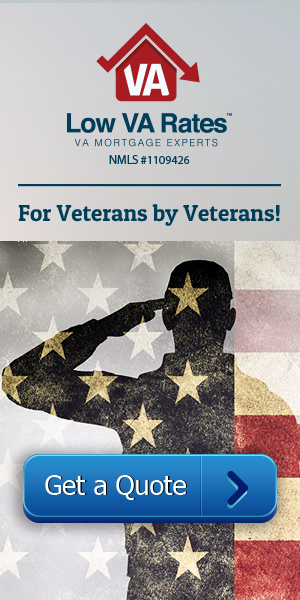 Veterans and active-service members qualify backing by the Department of Veterans Affairs (VA). These VA loans offer interest rates remarkably lower than other comparable loans, and a variety of other perks come with them, placing them among the most desirable loans out there. Credit score, you need to look at the current market condition, debt-to-income ratio, and the duration all factor in to determine your individual VA loan rates today. The better these elements, the better the percentage. It’s as simple as that. VA rates vary according to differences in these factors, but a few other things factor in that have pretty much nothing to do with you. The lender, for one. Some lenders just don’t give as good of terms as others. At Low VA Rates, we pride ourselves in offering outstanding customer service and great rates. We want you to enjoy your home, and we feel a home loan should be opening doors, not closing them. A second differing element is location. Some areas boast low interest when others don’t. While this shouldn’t be the main reason you do or do not move to a certain area of the country, it can be something you consider as this will affect you for many years. APR is Different, but How? Taking a slight turn, let’s talk about APR. Most people are unaware of what the difference is between APR (annual percentage rate) and interest rates, but not knowing harms them and loses them a lot of money. APR calculates what the loan costs over its entire life. When comparing two loans, it’s best to look at their APRs since these rates allow you to see everything on the same plane. Knowing your APR also helps you calculate where the break even point is. It can be difficult to completely understand the annual percentage rate, so either research more articles that talk specifically about it on our blog or ask your lender how your home rates compare and fit into the bigger picture. Below is a video explaining more about what is APR. If you do qualify for a VA loan, its highly recommended that you take advantage of the benefits . VA percentages will almost always be lower compared to other mortgages. The reason why is that there isn’t nearly as much risk for a lender to give out a VA approved loan since it’s backed by the VA, meaning they will cover a percentage of the cost should the borrower default. With little risk, the lender doesn’t tack on hefty rates. In fact, VA loans typically have rates between .5 and 1 percent lower than other conventional loans’ rates. If you’re familiar with mortgages at all, you’ll know that the amount of money saved would add up extremely quickly. And if your mortgages ever became unfavorable, VA refinancing options, such as the IRRRL, drop rates even further. But good rates aren’t the only benefits you get. Consider no money down and no required PMI. Sounding good yet? To learn more about your VA benefits and the VA loan rates today give us a call at 866-569-8272 to speak with one of our VA loan experts.